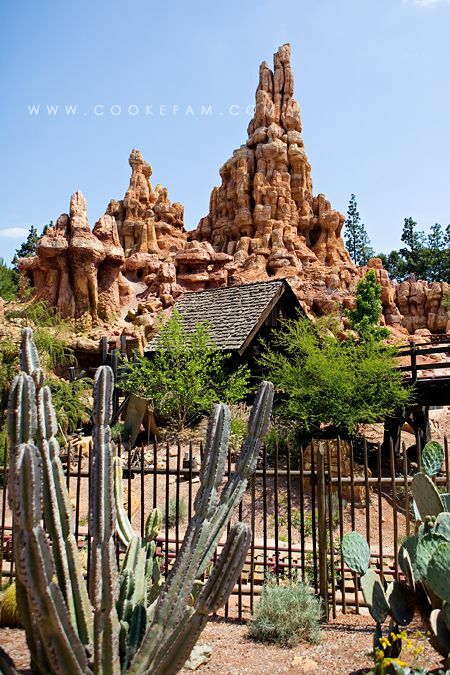 This post is all about Disneyland...the park itself. I really, really had to be selective to show only these 49 photos of the 2.5 days that we spent in this park. 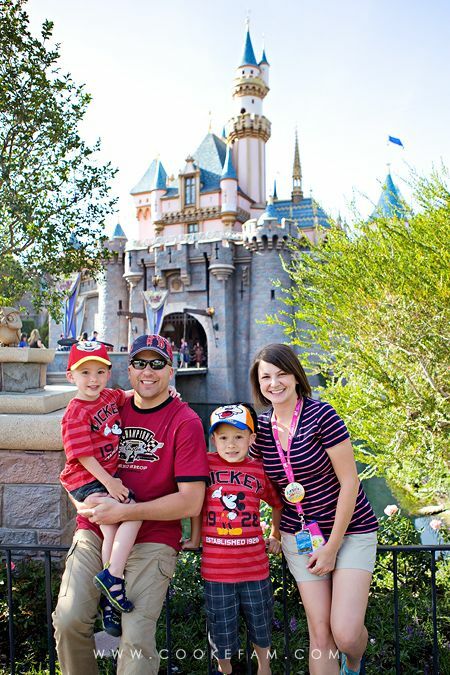 Some of these are the Photo Pass photos....like this first one on our very first day at Disneyland right inside the gates. 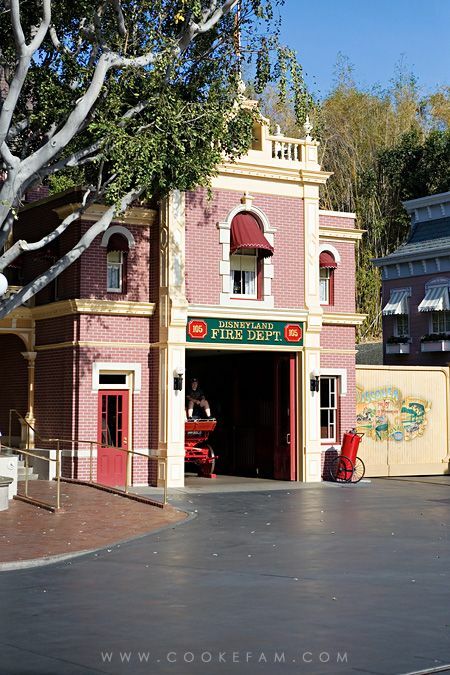 And on Main Street (I love Main Street), above the Fire Department, is Walt's apartment. A lantern stays lit in that center window in remembrance of him. 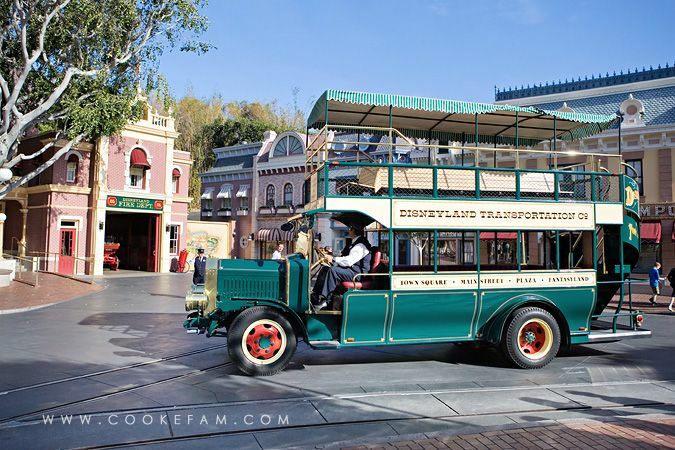 Although we meant to, we never did ride any of the Main Street Vehicles. But, we did have a look at them as they went up and down that thoroughfare. 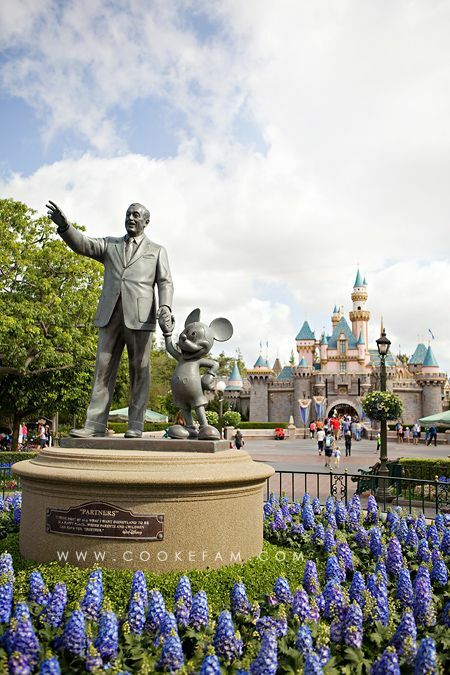 Our first glimpse of Sleeping Beauty's castle was from in front of this Walt and Mickey statue with those gorgeous blue flowers. 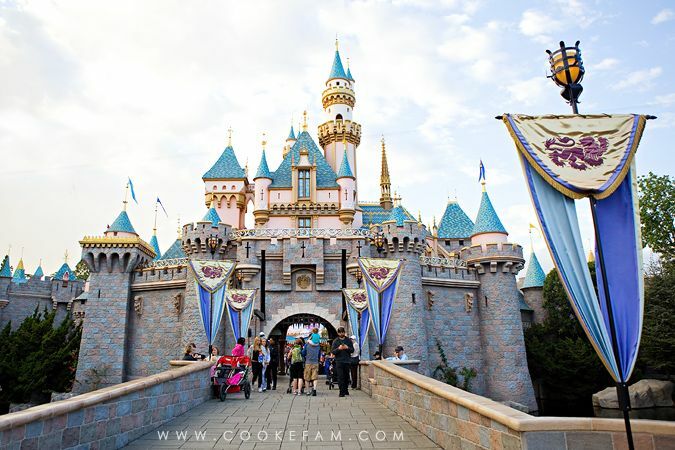 My first impression of the castle was that it was beautiful, but small...I've only ever seen Cinderella's at Disney World and it is markedly bigger. I love the story of Sleeping Beauty that's told through words and scenes inside the castle, though. That was really fun to walk through. 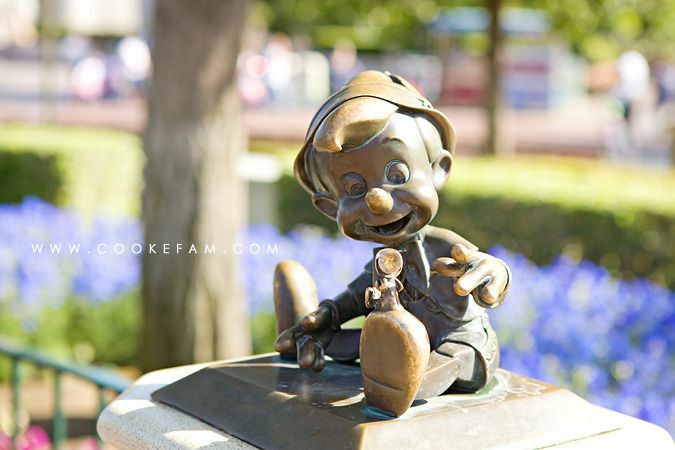 And I really loved all the little figures that were fanned out around Walt and Mickey's statue. Each one was really fun and sweet. 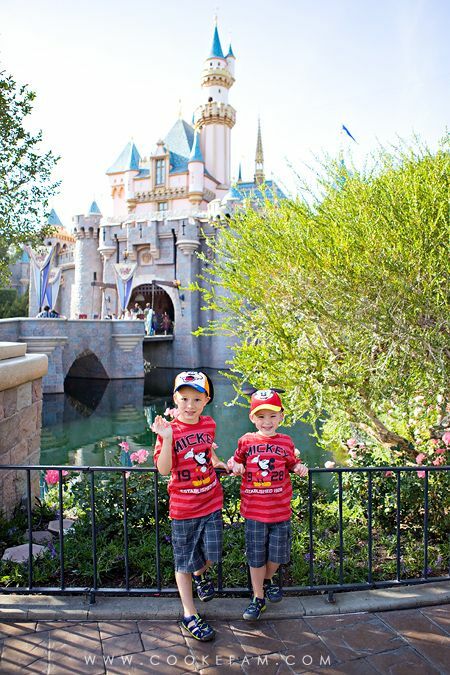 The classic moat and draw bridge are neat and the boys really loved the castle. 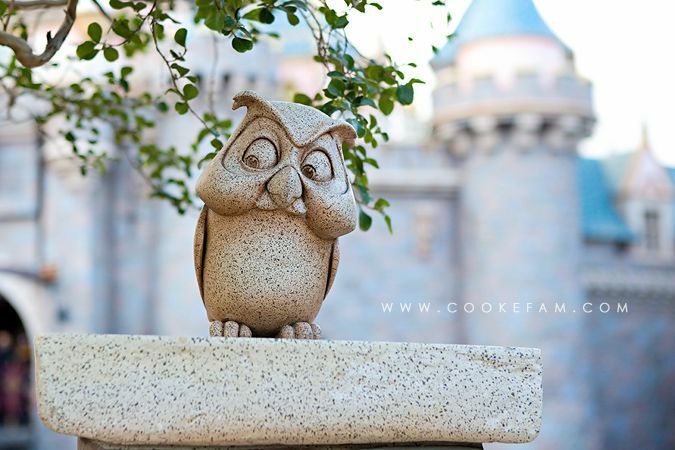 As big of a fan of The Sword and the Stone as I am, you know I had to stop and photograph our friend, Archimedes. "Who? What, what?" 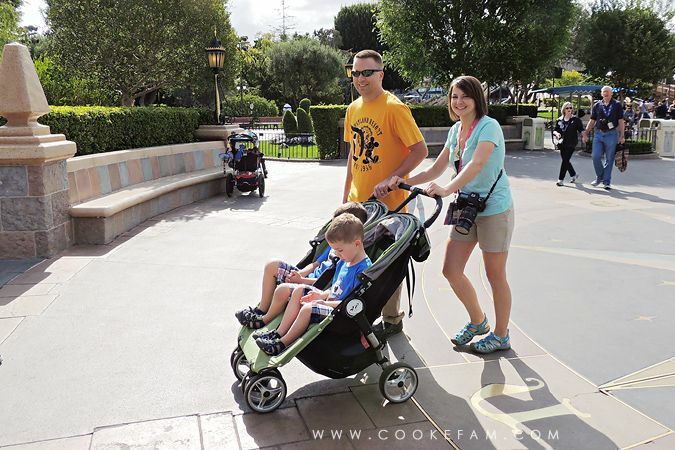 Our first day in the park, the boys were NOT interested in letting the Photo Pass photographers take our photos beyond that first one. Once they entered the gates, I think there was too much for them to see and do to want to stop at all. 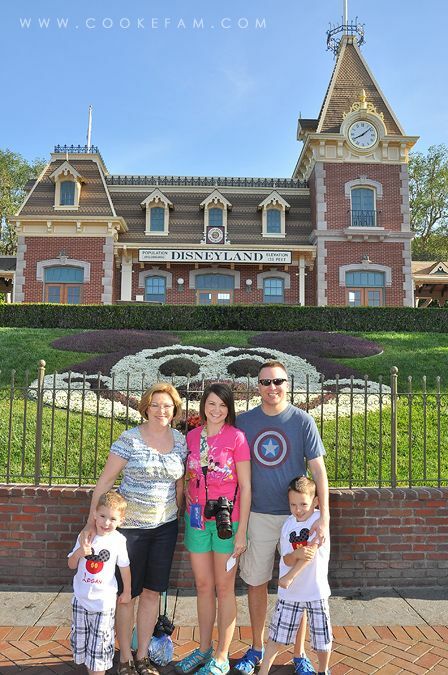 But by the second day at Disneyland (and our third day at the parks), they were better. We're about to pass through the castle into Fantasyland...otherwise known as the most crowded place known to man. Goodness. This was an Early Magic Morning and everyone went to Fantasyland. The first day we were there and got into the park with an Early Magic Morning, we went to Tomorrowland and it was much less crowded. Still, I think we breezed through Fantasyland fairly quickly despite all the people. It is a pretty compact land so you really feel the crowds more. 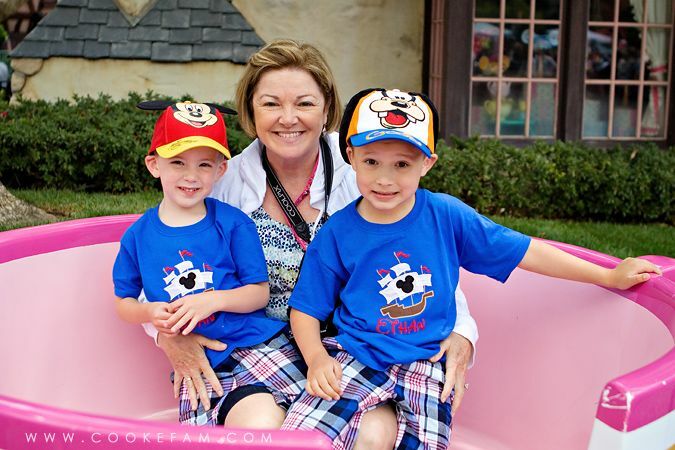 Here we are on the Storybook Canal Boats ride. This was so much fun. Being a unique ride to Disneyland, I had never ridden it before, and I really enjoyed it. The boat driver told the boys they could sit up on the flat part at the front of the boat, which was the best vantage point on the whole boat. 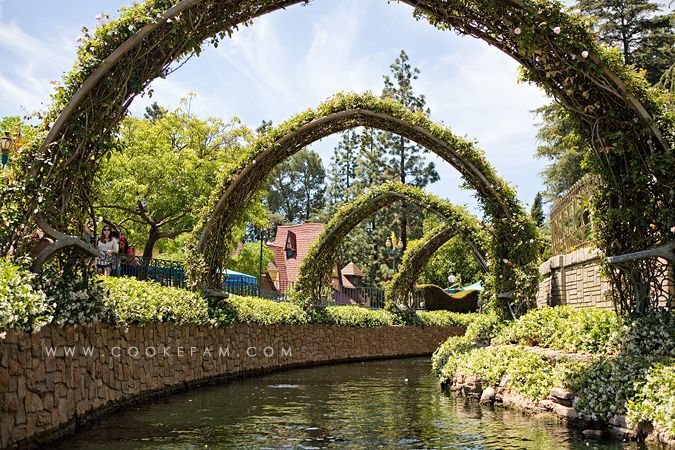 It's really quite a beautiful little ride filled with green and flowery landscapes as well as the "patchwork" gardens...an idea straight from Walt himself. 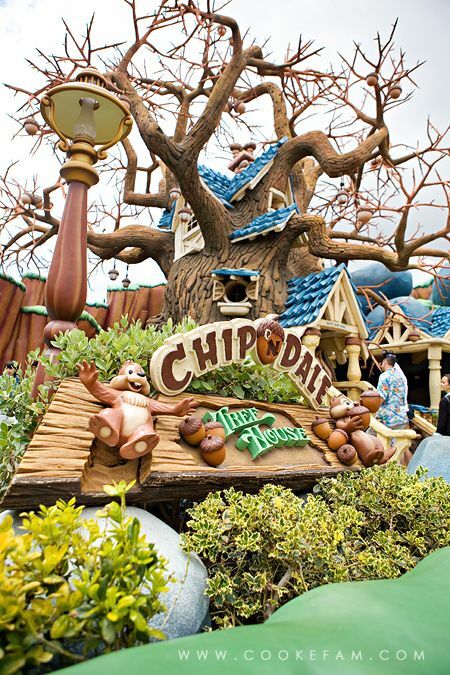 The main point of the ride is to see all the miniature lands that represent many of the Disney stories. 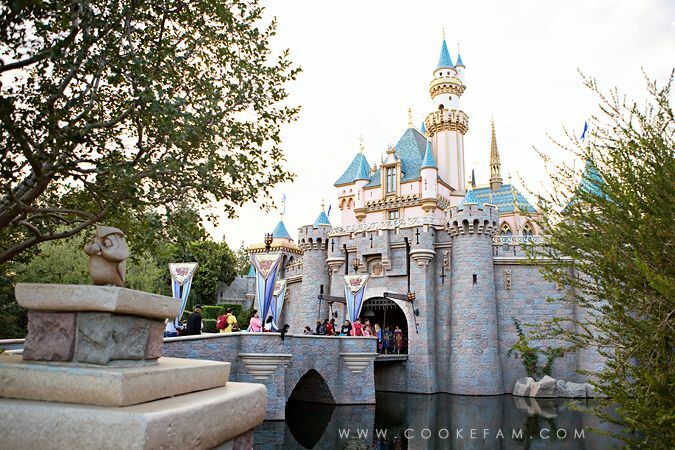 For instance, this one below is Eric's castle from The Little Mermaid. 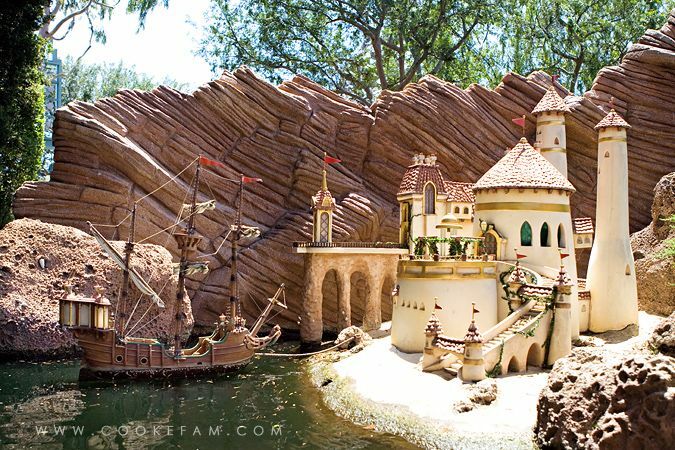 There were also castles and villages from Alladin, Cinderella, Alice in Wonderland, Peter Pan, Pinocchio, Snow White, and a few more. I am sure this next ride (below) needs no explanation. And having ridden its copy in Disney World, I can say that the set up of this ride wins. The lanterns hanging above the ride and the quaint White Rabbit's house nestled up next to the ride make it somewhat more magical. But most importantly, the boys loved it...and no one got sick spinning around and around! 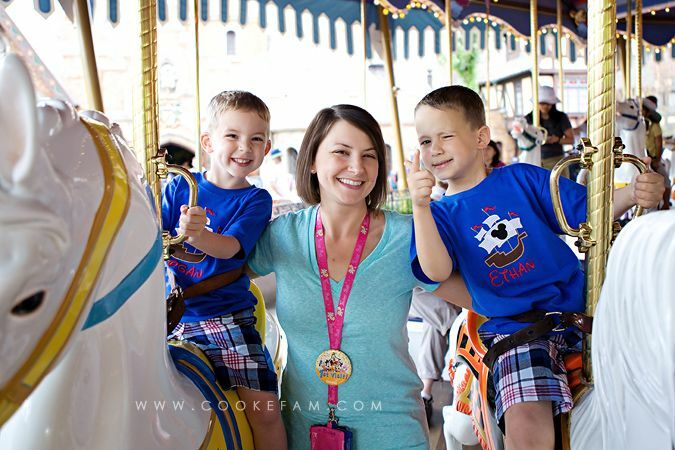 The boys are always magnetically drawn to any carrousel anywhere, so of course we rode King Arthur's Carrousel. 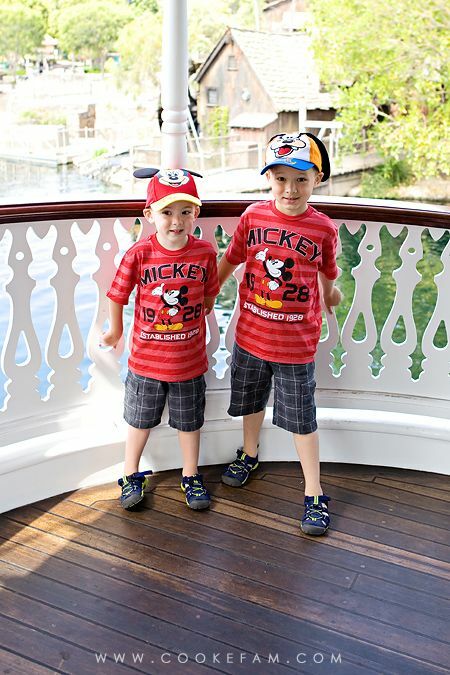 We also purchased hats at the Mad Hatter's hat shoppe. All of us bought a hat here...even Mimi, me, and Casey. But the boys hats are my favorite...they wore them the rest of the day. 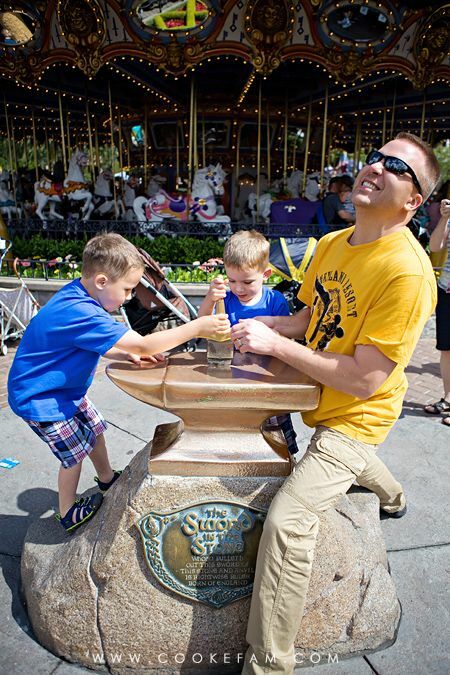 On our way back to pick up our stroller, the boys gave a valiant effort toward lifting the sword from the stone. No Arthur's in our party, however, and the sword stayed put. Other rides we rode in Fantasyland that are not pictured were Peter Pan's Flight, Snow White's Scary Adventures, Dumbo the Flying Elephant, the Casey Jr. Circus Train, and Pinnochio's Daring Journey. Unfortunately for us, Alice in Wonderland and It's A Small World were closed. 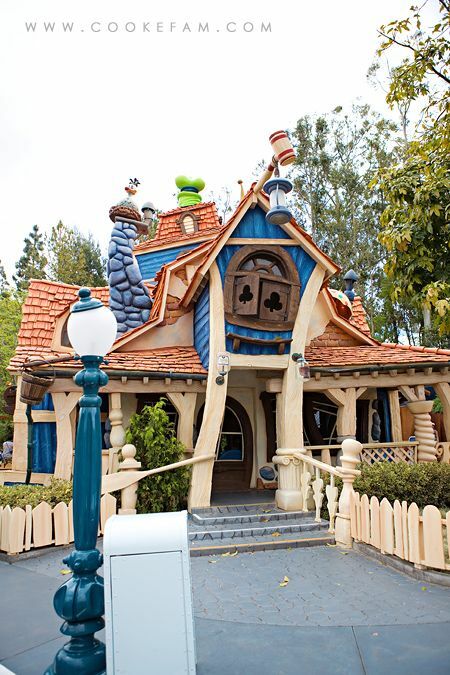 I was totally bummed about both of those because Alice is a ride that is unique to Disneyland and It's A Small World at Disneyland is supposed to be better than (or at least a little different than) the one at Disney World. Oh, well. I guess we'll just have to come back, then! 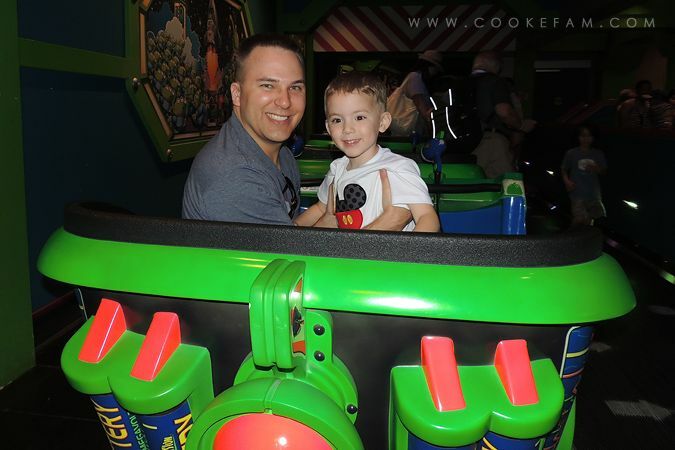 Over in Tomorrowland, we thoroughly enjoyed Buzz Lightyear Astro Blasters. I mean, it might be one of our top three rides. And we rode it at least 3 times, maybe 4. 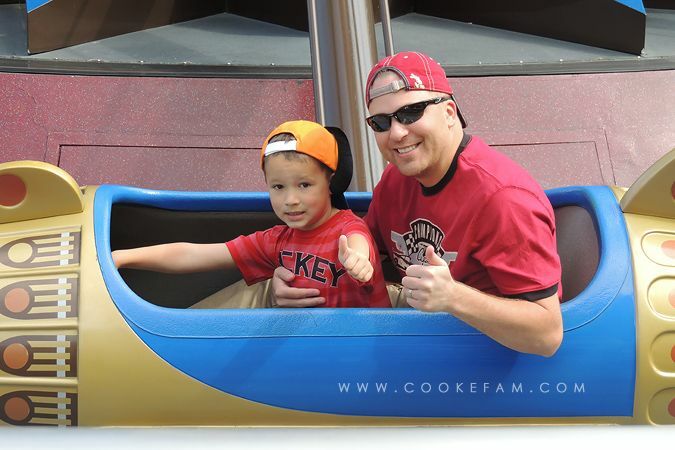 Although the boys really loved this ride because it is interactive and they absolutely love Buzz, the adults really liked it too. It's really well done. We also rode the Astro Orbiter twice. 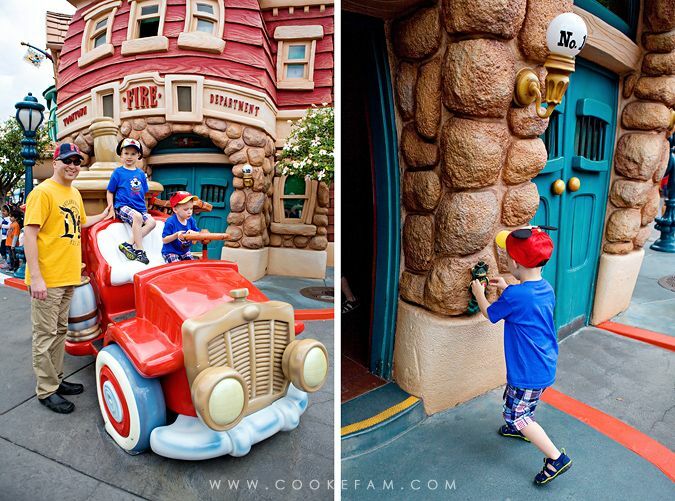 I think the boys loved being able to control how high they went just like on the Dumbo ride. We also enjoyed Star Tours twice and the boys are still talking about the funny "golden guy" (C3PO). New generations of kids are still enjoying Star Wars...amazing. We also rode Space Mountain. As I knew, it was dark and fast, but both boys rode and were champs. Ethan was scared and didn't want to do it again. Logan was quiet, but seemed like he liked it. It may have been a bit dark for him too. 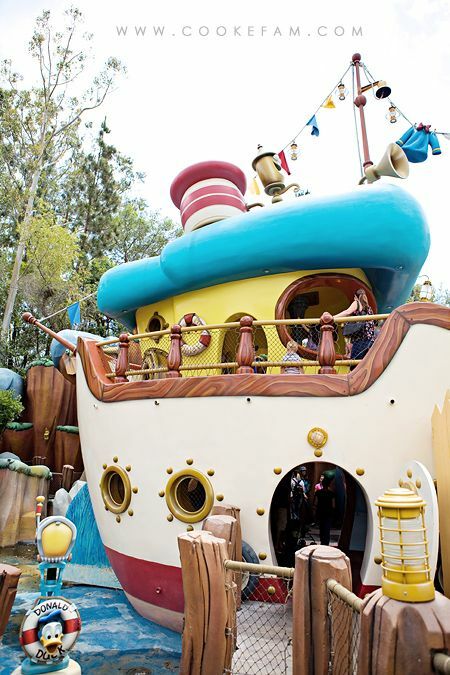 The Finding Nemo Submarine Voyage was closed while we were there too...and we never heard the end of it. 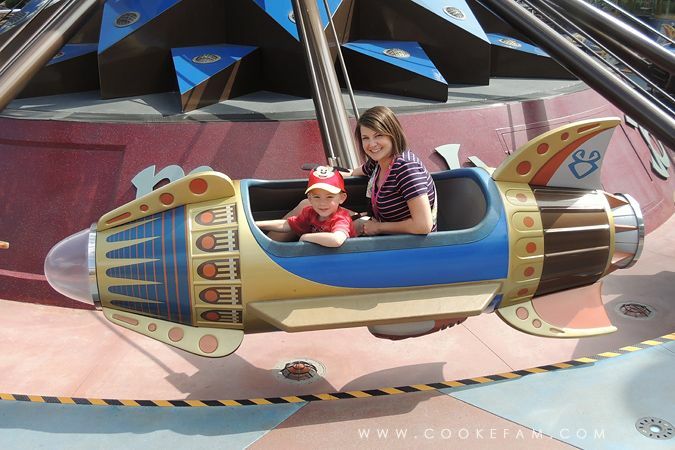 Ethan is still asking me if we can go back to Disneyland in the fall to ride it. 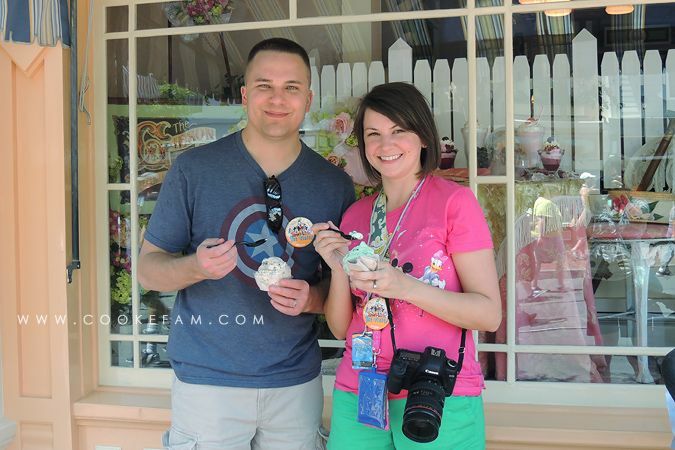 Here's me and Casey enjoying some ice cream on Main Street. 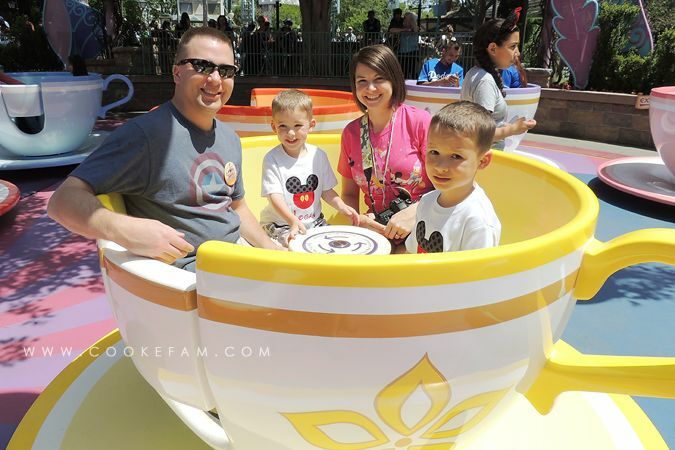 We are more of a "go and do" rather than a "sit and eat" type of family at Disney parks, although we do like to have some treats. And we love ice cream. 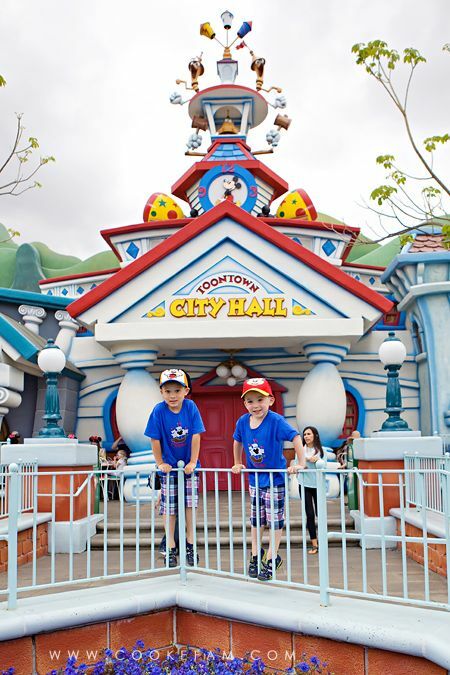 One of my main memories as a child at Disney World is visiting Toon Town. 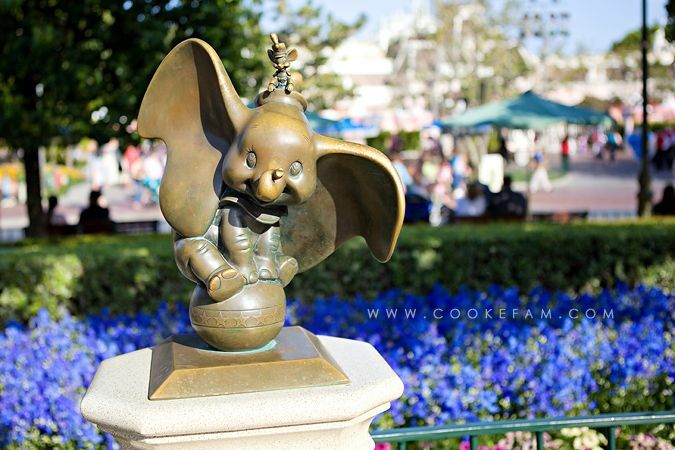 Now it no longer exists there, but luckily for us, it is still at Disneyland. And I loved it so much...especially seeing it through the eyes of the boys. 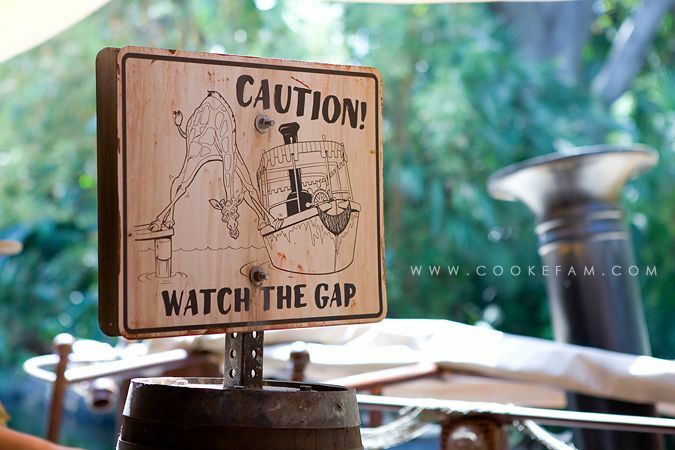 It really is a cool land with all sorts of fun, interactive surprises if you stop to notice the details. For instance, that mailbox opens...and talks. The boys totally cracked up at that. 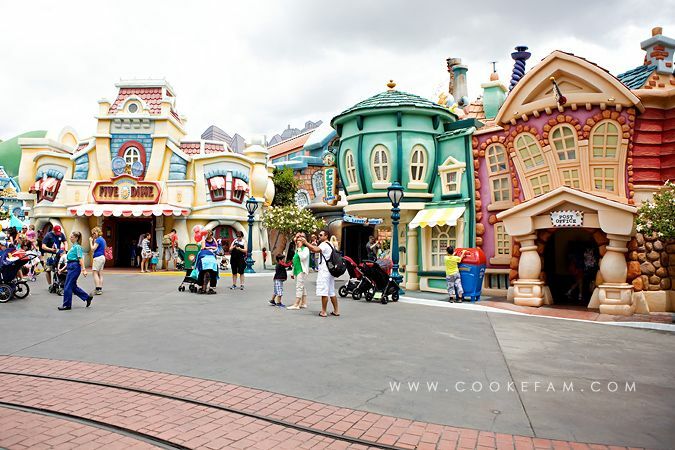 I guess I really love the whole "cartoon" exaggerated feel of Toon Town. 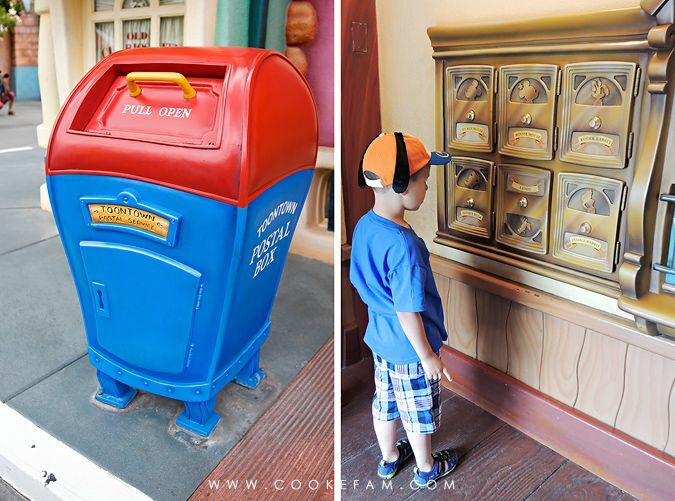 And again, I think it's because Disney does such a great job of attending to all the details so that you feel completely immersed in the experience. There's hardly an inkling of "reality" anywhere to be found. I love that. We perused each of the character's houses too. 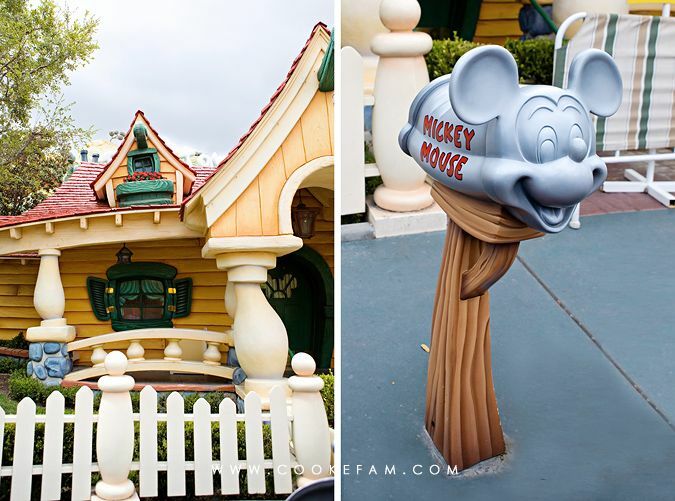 Here is Goofy's...very easy to tell it's his house even without his name on the mailbox. And then there's Minnie's. Again, no mistaking whose house this is. 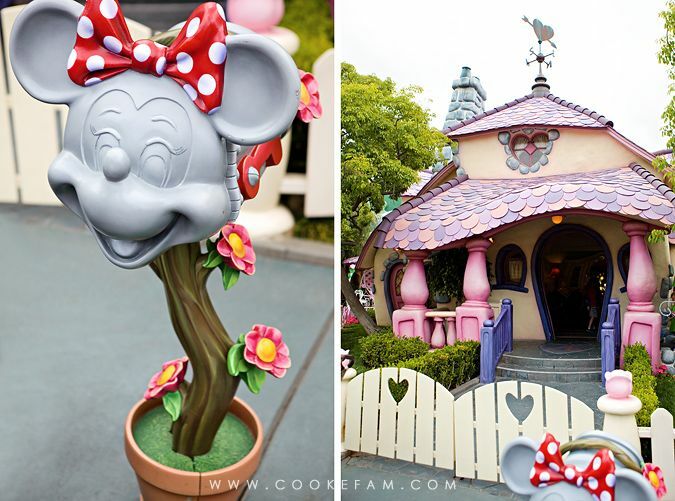 We had already met Minnie on Main Street, so we didn't hop in line to meet her here again. 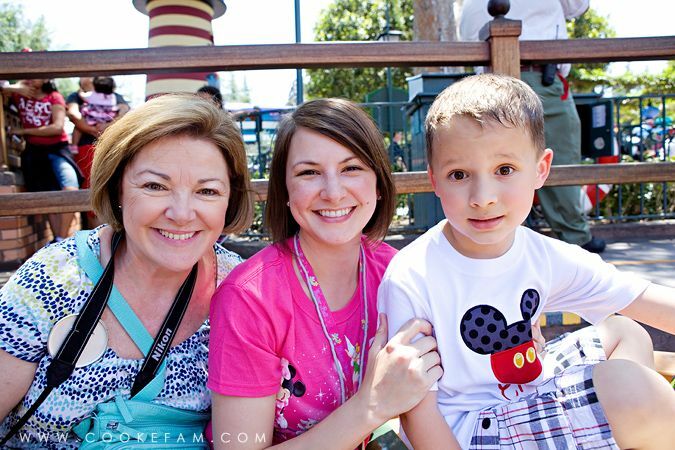 But, we had not yet met the main Mouse himself, so we did get in line at Mickey's house to meet him. 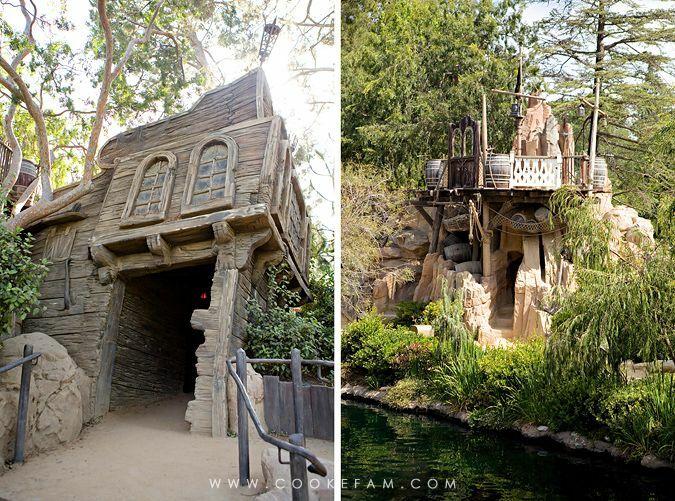 The boys had a brief, but fun, chance to explore Chip n' Dale's tree house. 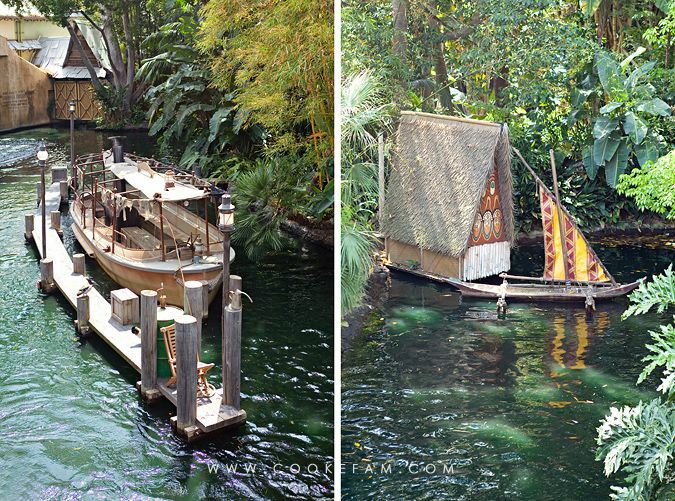 And Donald's boat house as well. Actually, I wish we had had more time (or taken more time) for them to play here. It was really a fun land. 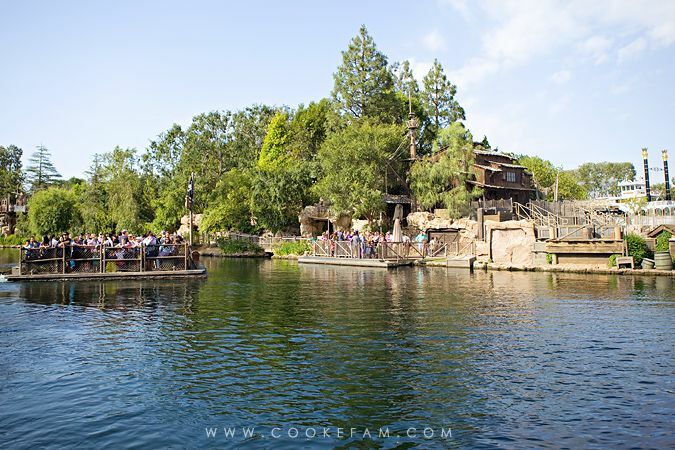 Over in Frontierland, we visited Pirate's Lair on Tom Sawyer Island. I am so glad we took the time to go over there. The boys loved all the tunnels and just ran around everywhere. They were shocked that there actually was treasure too. 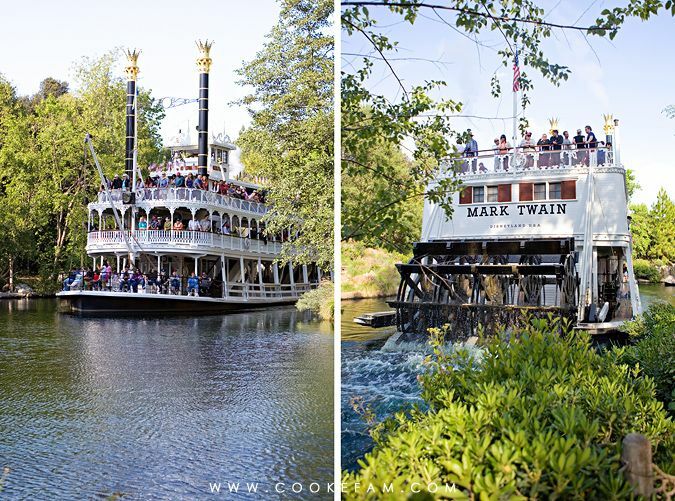 We also rode the Mark Twain Riverboat, which was a fun experience. The sailing ship Columbia was not doing rides when we were there, but we got to have a look at it a couple of times. In Adventureland, although we never did stop for a Dole Whip (man!) 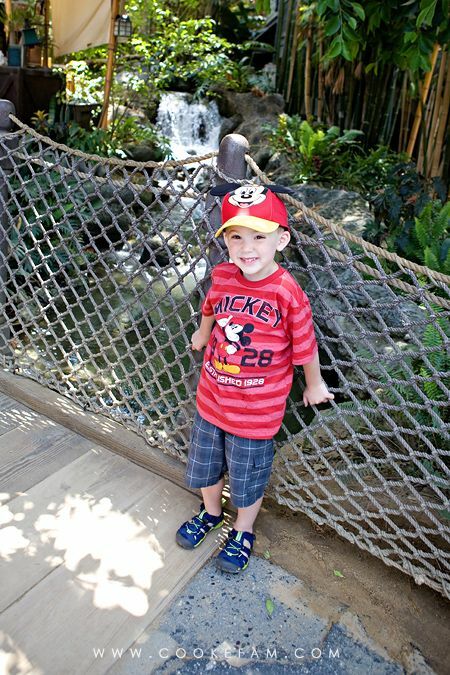 despite talking about it a lot, we did ride the Jungle Cruise, which was much, much cheesier than I remember it as a kid! It's still a classic and I'm glad we rode it. We climbed up into Tarzan's Tree House too. That was a lot of fun. The boys loved walking around way up in the tree. 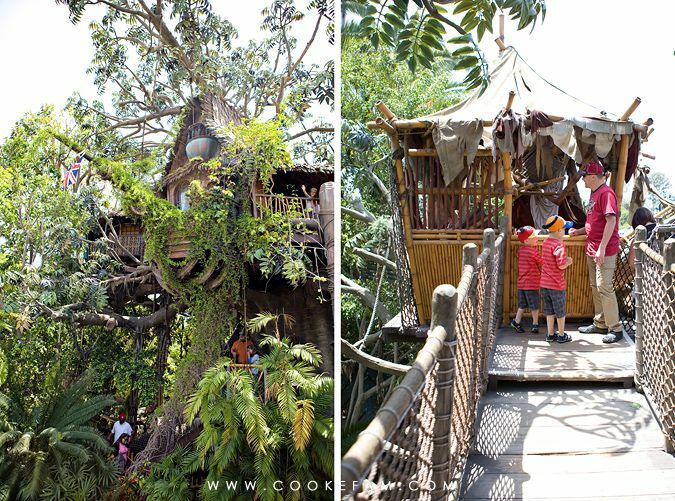 And I had flashbacks to the Swiss Family Robinson Tree House at Disney World, which I vividly remember. And again, another closure while we were there...Indiana Jones Adventure. Grrr. We were upset about all of these closures, but what can you do? This is another one that was really disappointing, though. 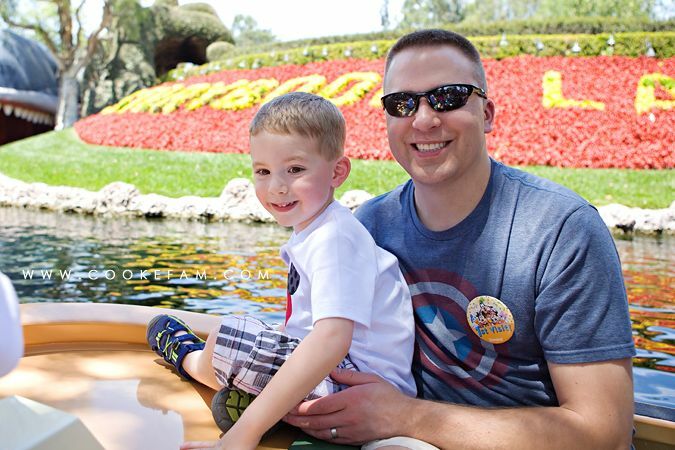 In Critter Country, we rode the Many Adventures of Winnie the Pooh and absolutely loved it. We hopped in line for a second time before the ride broke down. At least we were fortunate enough to ride it once. We also stopped to eat at the scenic and peaceful Hungry Bear Restaurant where we had the most delicious brownie funnel cake. 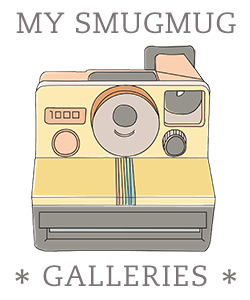 If you follow me on Instagram, you saw that one. Wow. Oops...these next two photos were supposed to be up there with Adventureland, but I'm too lazy to move them...we loved the Thunder Mountain Railroad. Well, actually, Logan loved it the most and kept asking to ride it again. We only did it twice, but it was super fun. Ethan was not so thrilled with it, but he did ride it both times like a trooper. See? A happy kid on the "fast train." He loves trains...and roller coasters, apparently. 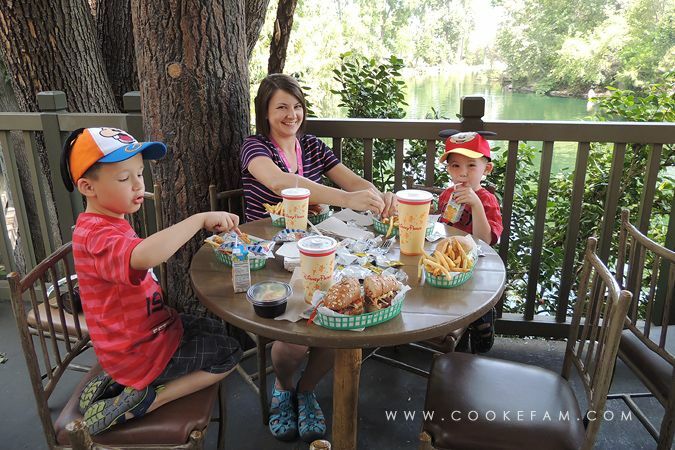 Our favorite meal at Disneyland (and maybe the entire trip?) was in New Orleans Square. I didn't take any photos during this dinner except for one Instagram, but it was the best meal. It was at Cafe Orleans. I had the New Orleans Gumbo and was incredibly surprised at how amazing it was. But the star of the show was definitely the pommes frites. Holy yum. They were SO good. 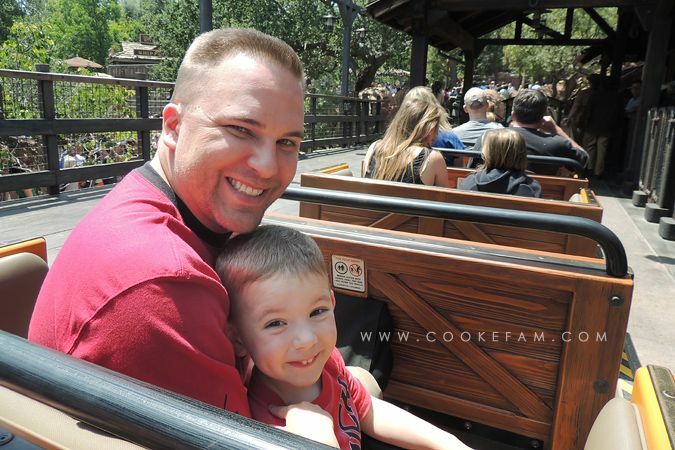 Also in New Orleans Square, we rode the Haunted Mansion...my favorite Disney World ride. The Disneyland version was very similar. The boys were terrified, but I think they did enjoy it! 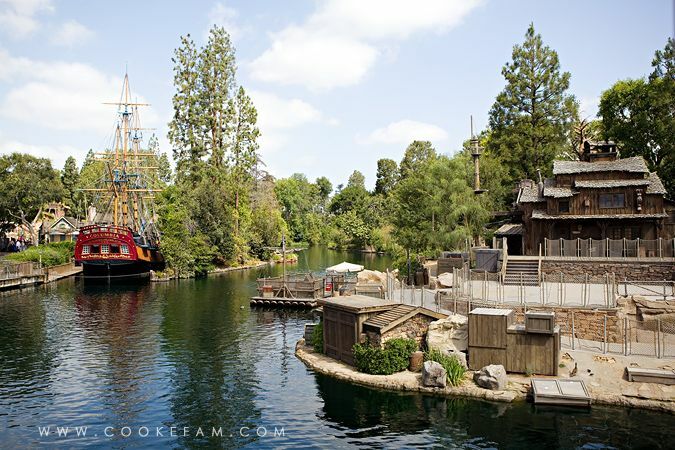 But, we didn't get to ride The Pirates of the Caribbean because it was...you guessed it...closed. Sigh. 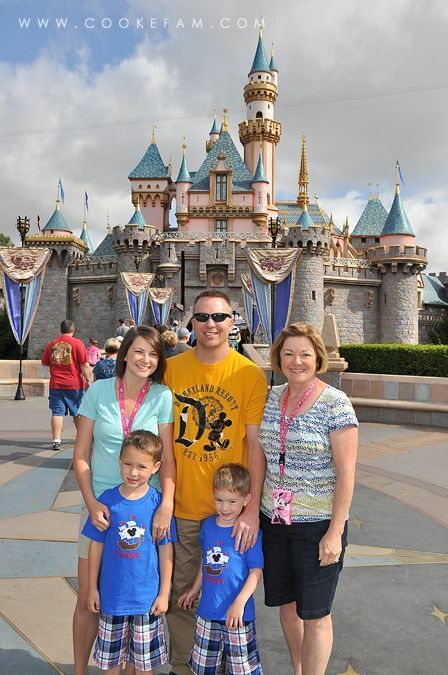 Disneyland was the last park we were in before we left for home. Needless to say, we didn't want to leave. I think a lot of people do Disneyland in one day. And if you live in Southern California, I guess that's a good plan and I envy you. But, in my opinion, if you're visiting from out of town, you need to give it at least 2 days. 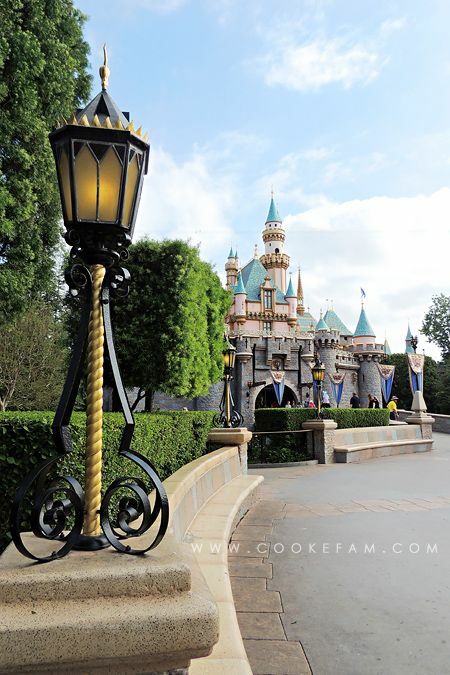 I think we could have spent a full three days at Disneyland Park and still had plenty to do...especially if we were able to ride all the rides that were closed. 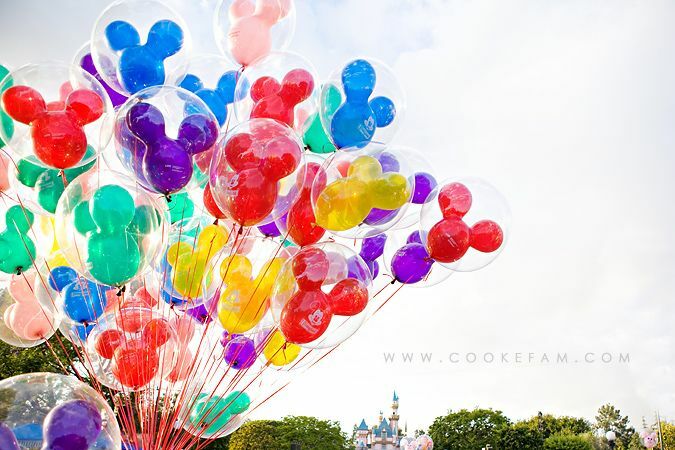 In planning this trip, I was thinking that this would be our one and only time to visit Disneyland. But, after actually going there, I think we may need to make at least one more trip here in the future.